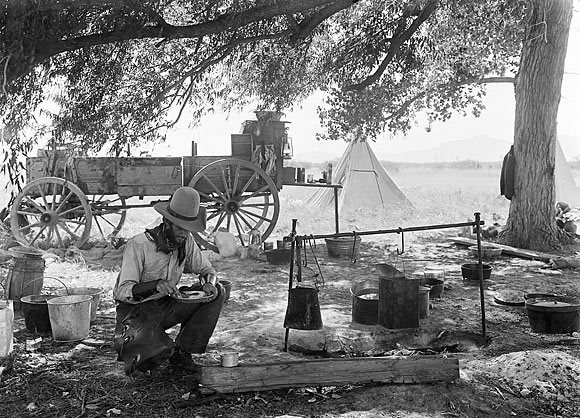 Here are a few of the Old West recipes we use at camp - tried & tested by cowboys ......................... Why not send us YOUR favorite recipe, or send in a request? Combine dry ingredients. Melt butter and add with buttermilk to the dry mix. Knead lightly (don't overdo it!) Pat dough out lightly on a floured board to about 1/2" thick and cut out rounds with a 2" plain cutter, or use a similar sized cup, glass or tin to do the job. A thick apple preserve - good on cowboy biscuits or toast. Bring to the boil and simmer for 20mins until apples are soft. Rub the apple sauce through a sieve to remove skins etc. Measure the puree into the Slow Cooker adding 1/2 cup sugar for each cup of apple pulp. Stir to dissolve the sugar. Add a pinch of salt and spices - 2 tsps Cinnamon, 1/2tsp Ground Cloves, 1/2 tsp Allspice, plus grated rind & juice of a lemon. Cook 10-12 hrs in Slow Cooker with lid ajar so that the liquid can evaporate. The Apple Butter should be dark brown, thick and smooth. Put into clean, sterilised jars or keep in airtight containers in the fridge. If you don't have a Slow Cooker, cook spiced puree in a large pan over a medium heat for around 2 hours, stirring all the time. Over a gentle heat, melt 1oz butter or margarine in a skillet. Mix in 1oz plain flour, stir until smooth and cooked. Gradually add tinned evaporated milk (canned cow), stirring all the time,for a rich sauce - or use regular milk (about 1/2 pint). Add salt to taste and plenty of black pepper. Serve over Biscuits or Chicken Fried Steak. Coat pieces of tenderised steak in seasoned flour, dip in egg/milk mixture (1 egg + 1/4 pint milk), and then in seasoned flour again. Mix buttermilk, eggs, sugar & melted butter in a bowl. Mix all dry ingredients in a 2nd bowl, then add to liquids - stirring slowly. The mixture should be stiff enough to knead lightly. Cut the dough into strips ( about 1/2" wide x 3" long) and fry in hot oil or lard. When cooked, remove from fat and roll in cinnamon sugar. Eat straight away - DELICIOUS ! 1 Onion & 1 Green Pepper diced and softened in 3 tablespoons lard melted in a pan or large skillet. For a tasty mouthful - take a nacho chip, spread with cream cheese and top with a sugared jalapeno slice. You'll be sure to love 'em!